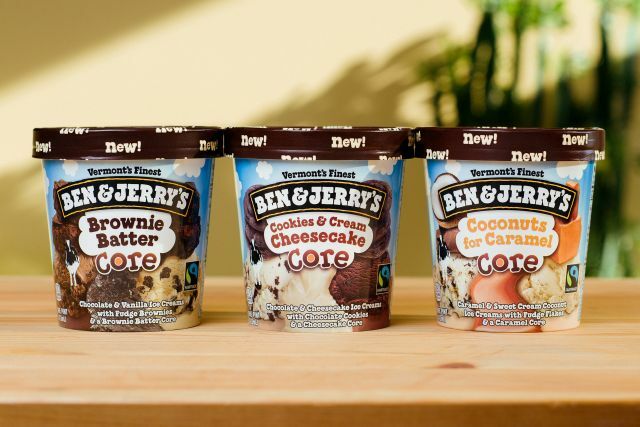 Ben & Jerry's introduces a trio of new ice cream flavors for the third installment to their Core line, which features a sweet core surrounded by ice cream. -Brownie Batter - Chocolate & vanilla ice creams with fudge brownies surrounding a brownie batter core. - Coconuts for Caramel - Caramel & sweet cream coconut ice creams with fudge flakes encircling a caramel core. - Cookies & Cream Cheesecake - Chocolate & cheesecake ice creams with chocolate cookies around a cheesecake core. The three new flavors are currently being rolled out and can be found in pints with a suggested retail price starting at $4.79. With their addition, Ben & Jerry's now offers a total of 10 different Core flavors.